Happy Friday and Happy Spring! I absolutely adore both looks. Kimonos are fresh ways to layer an outfit especially while the weather is not too hot. That third piece pulls even the simplest outfit together perfectly. Well I pray you and your family have a wonderful weekend. I plan to do some landscaping work in my yard. ..well maybe supervise the process..haha:) ..and hopefully play some tennis. Thanks Tiff! Sounds like you have a wonderful weekend planned! Loving the kimono, especially on the yellow and some cute bags you got there. You wear the most beautiful colors ever, great style Mica! Both outfits look great darling! Have a fabulous weekend! I love that you have purple jeans like this Mica!! I bet they are a fun color to pair with so many others!! And your bright purses are enviable!! This is such a great outfit formula. 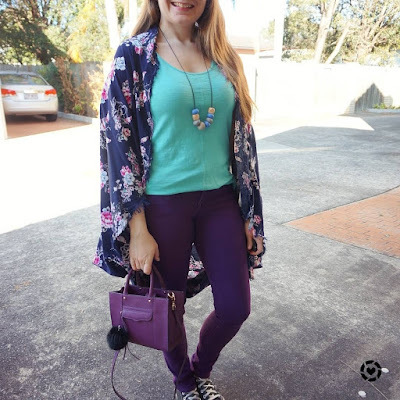 Kimonos are always a fun outer layer and it's great how you can interchange the components for different looks. Happy weekend Mica! Yes they are a great layer in the warmer weather! Heehee...boys will be boys, eh? Anyhoo, love both these outfits:) I do agree that kimonos do add something to outfits. Your colour combos are bang on as always. haha yes, they love making a mess! I really can't say what outfit I liked more, since the colours in both are simply perfect. 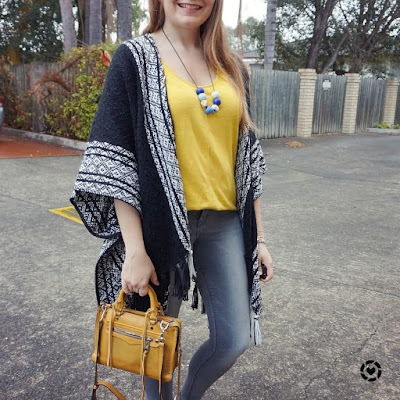 I love how you paired the bright yellow top with a mustard bag, I think those two shades of shadow match really well. I do agree that a pop of yellow is the perfect way to add some colour to the rainy day. I also agree that a kimono (or a long cardigan) is a great way to make an outfit more interesting and chic. An ideal way to layer an outfit. The second outfit is lovely as well. The shades of purple match so nicely. You look great in both outfits. Have a great weekend! Today is teacher's day so I have a day off and I can enjoy an extra long weekend:). Thanks Ivana :) Hope you enjoyed your long weekend! Oh I love your Rebecca Minkoff kimono! And I agree - they really are a great layer for adding some visual interest without making you too warm! Oooo I love both colors! Both of these outfits are amazing! Happy Friday to you! You always know how to style up an outfit so effortlessly Mica and those fitted jeans are gorgeous. Your love for Rebecca Minkoff is very clear in your blog posts and I can see why, they really are lovely and the perfect accessory! Sending love and prayers of comfort your way! Thanks Laura! I do love Rebecca Minkoff accessories, haha! Love the mustard and navy today. Your the queen of styling kimono's. I so need to wear mine more. Have a great weekend. I absoloutely love how bright your outfits are Mica! You're definitely inspiring me to try some coloured jeans as I love your blackberry choice, such a subtle difference but so much nicer than boring blue jeans I wear most days! Glad I could inspire you! It's a nice change from the standard blue jeans! I like your outfit formula! And no wonder you loved both looks! I think yellow with grey is always fantastic and I love also the colour combination of the second look. You definitely know how to style effortless but super stylish and cool! There is just no way to stay clean with kids around playing, i have given up trying. Oh, and I finally bought a kimono, totally influenced by you! I agree with Anne, there is no way to stay clean with kids playing outside. LOL! That first outfit is so cute! Kuddos for getting it together on a whim! What a fabulous color jeans! And that tee is perfect on it! Enjoy your weekend. Love the bright tanks in both of the looks. The way they bring light to the whole look! I love both of your outfits! I actually have a really similar kimono to your first one...I never thought to pair it with mustard colors before. That is a fantastic idea. I'm going to have to try that now. Thank you for the idea! Love both kimonos! That first color combo is my fave. I adore the boho chic vibe. 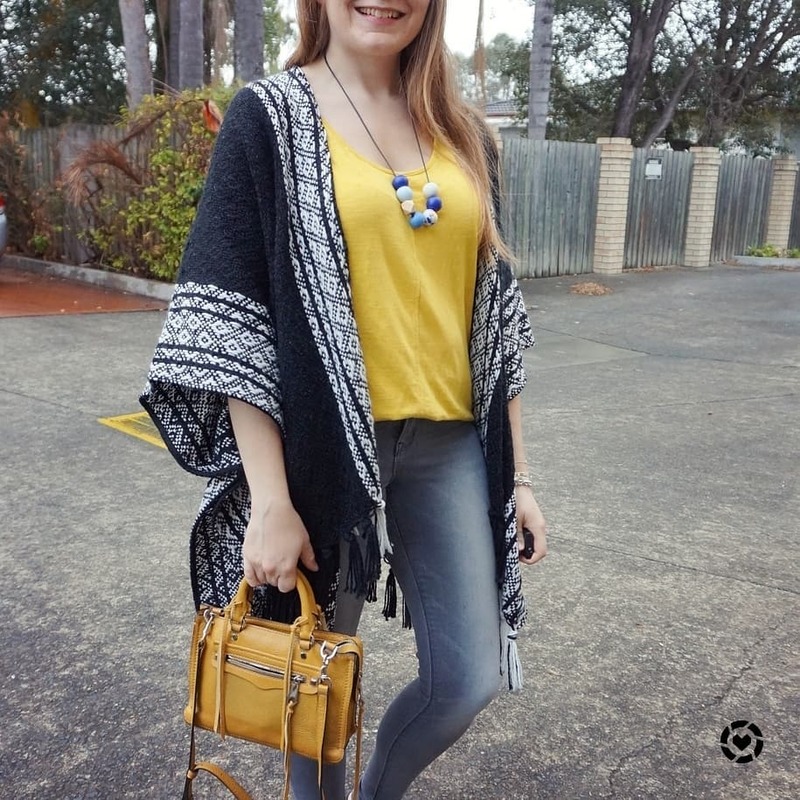 You always pair your bags well with your clothes, the mustard with that kimono, the purple with those jeans... you nail it everytime! Even though it's not Fall for you, I get a Fall sense in your looks here! Very pretty! Thanks Lorna! It was a cooler start to spring for sure! Love the purple look, such a cute colour and it really suits you! I love how your outfits are always perfectly colour-coordinated Mica! 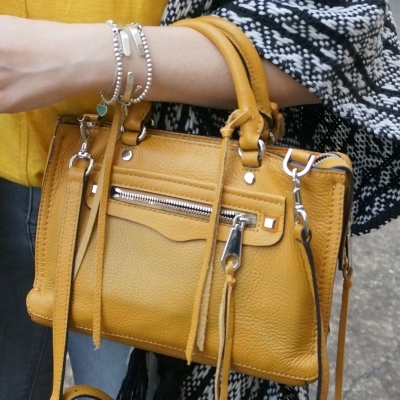 Your love for Rebecca Minkoff always shines through too! Hope you're having a fab weekend! Love those little bags, so cute and the kimonos. I have a wrap that's similar to the black and white one and it's great for this type of weather. hehe I do love my bags! I always love how you match your bag with your outfit. And you always have the prettiest bags! This item is always a good idea for the cool autumn days. And I love this little, eyecatchy bag, This vivid color suits your look perfectly. Amazing combination. Yay, the kimonos are back! :D I always love how you style them, hun. I especially like the colour play in the first outfit. Mustard is so popular, I've always been a little afraid of it myself but I might bite the bullet... Thanks for sharing and inspiring me as always, babe! I love love the colors in your second outfit! Such a pretty effect! Too bad those pigs in mud are so messy though, haha! So very messy! Lots of fun too though. I also love that about kimonos. They are one of these pieces that you can just throw on over almost anything. Both of your outfits are lovely. I love the color combinations. The mustard looks beautiful with the neutral grey and I really like the more unexpected purple with turquoise. I finally got a kimono, but now I need to test the waters and style it with some color! I'm sure I can find plenty of inspiration here. They really would! It was so much fun for them! So glad I could inspire you - hope you find your purple pants! You really have the cutest combos with your bag dear. Love how you style your outfit with the bag.